A 30-year holiday tradition in a small New Hampshire town is in jeopardy, but people who live and work in Exeter are doing everything they can to make sure downtown isn't dark for Christmas. "It's magical," said Kathy Lemerise, who owns a downtown gift shop called Trend's. "Very Norman Rockwell." For the last three decades, Lemerise could look out her storefront windows and see a glowing downtown Exeter. "I get a little emotional, because it really is why people come to Exeter and why people move to this town," Lemerise said. The holiday lights tradition has illuminated Water Street for 30 years. Last week, Unitil notified the Holiday Lights Committee that during the sidewalk construction this year, the town lost part of the electrical infrastructure needed for the lights. "Our hope has been a small miracle of Exeter size would take place," said volunteer Beth Dupell. She's been decorating downtown for 20 years and isn't about to see the tradition lost. "We put a lot of heart and soul into this," Dupell said. "It's really just part of the core of who we are and without it I just think the holidays will be a whole lot dimmer." So by Wednesday afternoon, Dupell and other volunteers had logged 300 hours trying to get he lights back on, Unitil workers were energizing circuits, the fire department was installing bulbs and town officials were inspecting wires. "It will probably go right down to the wire, no pun intended, but I think we're going to make it," said Town Manager Russell Dean. 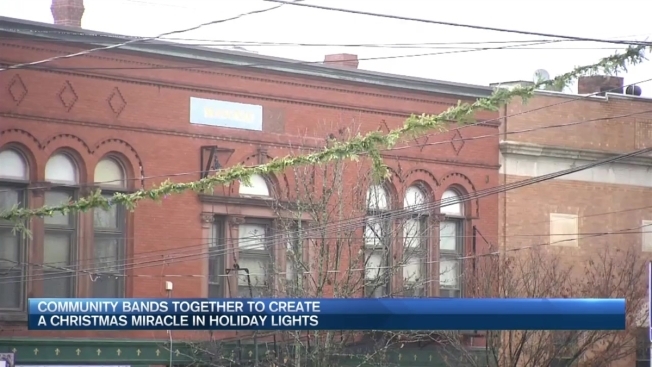 It's a town-wide effort to protect a tradition and preserve the magic of the holiday season. "I'm a believer that everything is possible," Lemerise said. "It sounds like we might have a little Christmas miracle here." As long as the weather dries up enough for Unitil workers to energize the third circuit downtown, town officials say the lights should be on in time for Santa's arrival in Exeter at 4 p.m. Thursday.